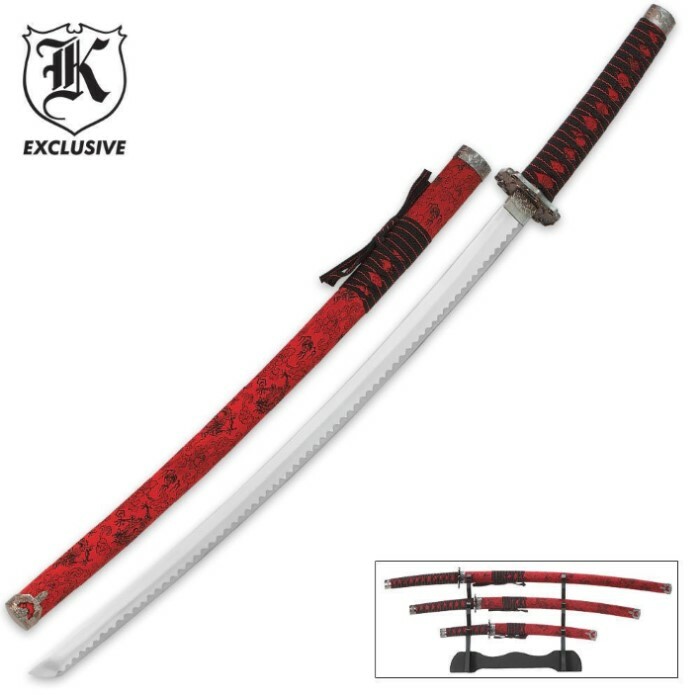 Red Dragon Samurai Sword Set | BUDK.com - Knives & Swords At The Lowest Prices! Finally, a classic samurai sword set that won't slash into your savings! Each traditional piece is constructed with a heat-tempered carbon steel blade. The hardwood handles are precision wrapped with crimson and black cording coordinating with the unique dragon design featured on the matching scabbards. These swords are good for display but terrible for practice.First these swords are not full tang at all, second they are not sharp at all. i don't recommend you get this set if you want to practice with them but i do if you want to display them. swords are nice to look at, there for display only, not sharp at all, they are not full tang.. one hit with them and they brake apart.. The scabbards are better than we expected. Beautiful set. As a display it is excellent even though the sheaths are plastic and the blades are not sharp, for the money a good buy. It is a pleasure to do business with BudK. They are courteous and professional whether you are buying, returning or replacing and that is important in my estimation. I have other items from them and am thoroughly satisfied. This set is a great buy. The swords come a little dull and the sheath is made of plastic, but it has a sturdy build. The stand for them is kinda hard to assemble but a little elbow grease fixes that. Also, the handles stink when you first get them cause they are in styrofoam. It is still worth the money.